Strong VPN is one of the most widely recognized names in VPN service provision in the world today. Originally established back in 1995, the team behind the brand has a length of experience that’s largely unrivalled in the VPN industry. Of course, this doesn’t always translate to better service or value for money, so it’s important to look beyond the brand to see what exactly is on offer. As of today, Strong VPN is one of the largest in the world – the company operates a full 370 servers spanning no less than 22 countries and, at the time of writing, owns about 12,000+ IP addresses. They claim to offer the ideal service for pretty much anyone looking for a VPN to sign up with—-be it for general communication, entertainment or large-scale business purposes. The system has been designed to work flawlessly on a range of platforms and operating systems, meaning those using Windows, Linux or Mac computers are all able to get the best from the services on offer. In addition, Strong VPN is also fully compatible with Android and iOS mobile devices, such as tablet PCs and Smartphones. One of the most popular features of Strong VPN for expats in other countries is its DD-WRT router setup support, which allows for Netflix to be used via an array of digital media players and computers running Windows or Mac operating systems. As it stands today, there are three price plans to choose from when signing up to Strong VPN for the first time – full details of which can be found on the official site, along with special offers. Prices vary in accordance with the usual variables, including server location, server access and VPN protocol. The packages on offer are separated by protocol: Open VPN, PPTP and the top-end “Premium” plan that combines both Open VPN and PPTP. Premium packages also open up every available country to the subscriber. Newcomers can sign up to the plan of their choice for a time period of three months up to 12-months – again depending on the plan chosen and its attached conditions. The very cheapest plan of all is the lite PPTP, which comes in at just $7.95 per month. Next in line is the PPTP Deluxe package at $16.95 each month that brings the options of several more countries to the subscriber. In the Open VP category, the prices of the packages ranges from $11.95 up to $21.95 each month. Those looking to take home the best of all worlds and all countries on offer can expect to pay $34.95 per month for the Premier Strong VPN package. The service makes payment as simple as possible; a wide variety of payment types are accepted with strong VPN— including Wire Transfers, Western Union, American Express, Visa, MasterCard and PayPal. If looking at the downsides of Strong VPN, two things come to mind— though neither are particularly deal-breaking when compared to the negatives of some other VPN providers. A small drawback is that a very small number of accounts may require verification before it’s possible to start using the service. 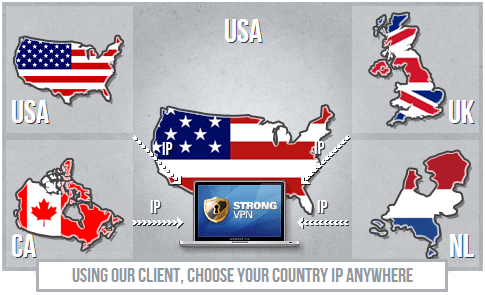 This is a rare occasion and the vast majority of users can start using StrongVPN immediately after purchase. This is a measure that’s been put in place voluntarily by the company and is geared toward keeping fraud to an absolute minimum. Thankfully, once you actually get yourself online and are able to make use of the service, it turns out to be one of the easiest to use on the market today; the user Cpanel is teeming with tutorials and guides to keep you on-track. Each operating system is covered individually and you can always get back in touch with customer service if you have any issues. As for the second drawback – each time you would like to connect to the service you have to do so manually. This isn’t a big deal, but it’s usually nice for a VPN to feature an option whereby it automatically kicks in as soon as you load up your OS. Having recently expanded its army of servers to a full 378 at the time of writing, it’s usually safe to say that there are enough out there to keep everything running– smoothly and speedily. Video streaming and other popular services tend to run without a hitch, though it’s not uncommon to encounter buffering problems and general hiccups, when loading up stream high-end HD content and movies. This, of course, depends entirely on the country in which the subscriber lives, the country from which the media is being streamed and the type of media in question. Hiccups are impossible to rule out completely, but for the most part Strong VPN has a reputation for being a name to count on— with a service that’s consistently reliable. There were recently some complaints that service interruptions become more frequent, but this was due to the essential upgrades and expansion needed to continue improving service provision. One of the best things about Strong VPN is its wonderfully wide-reaching compatibility with a variety of popular operating systems and platforms. The service is now fully compatible with Windows 8 and continues to support Windows XP, Windows 7, Windows Vista, Linux and most builds of Mac OS X. In addition, you can use Strong VPN on-the-go via an Android or iOS Smartphone or tablet PC. As far as web browsers go, the service seems to work without a hitch when used with Mozilla Firefox, Safari, Google Chrome, Internet Explorer and Opera alike. Once you’re up and running, you’ll be provided with various mode of communication for when you need them–including live online chat, telephone numbers and email addresses. Any communications made result in a ticket being issued so there’s no chance of your query getting lost in the system. By using one form of contact or another, you can get in touch with Strong VPN– 24 hours a day— and seven days a week. In addition, there are plenty of FAQ sections and tutorials on offer so there’s always the opportunity to solve your problems the DIY– way, without requiring any help. Strong VPN also offers a highly active forum where you can share ideas with other users. The server list is constantly ‘on the grow’, but at the time of writing Strong VPN has servers in the USA, United Kingdom, Canada, France, Germany, Czech Republic, Italy, Luxembourg Latvia, Norway, Romania, Netherlands, Russia, Switzerland, Hong Kong, Sweden, Japan, Malaysia, Singapore and Turkey. To summarize Strong VPN is a great example of a well-known VPN service provider with a reputation that’s beyond repute. They’ve been in the industry for longer than most VPN service providers and thus have huge experience to fall back on— plus the prices are low, the packages are extensive in scope and customer service is always among the best in the industry. 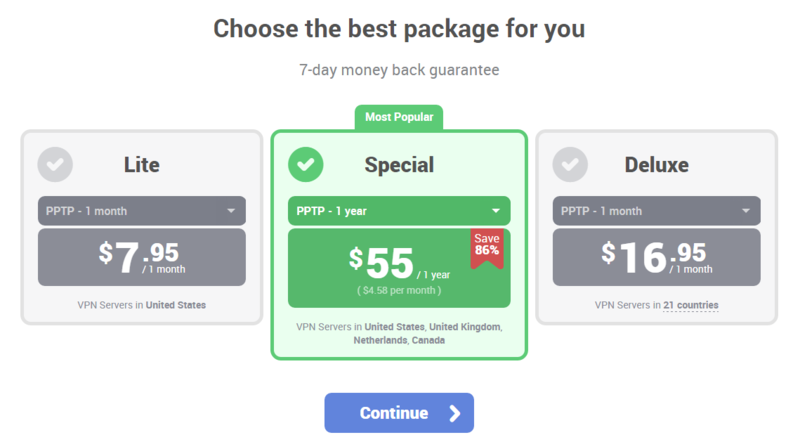 And what’s more, there’s even a money back guarantee offered to anyone that’s not totally satisfied with the strong VPN services in the first seven days of the sign-up, so you’ve really nothing to lose by giving them a shot.